“We did it! 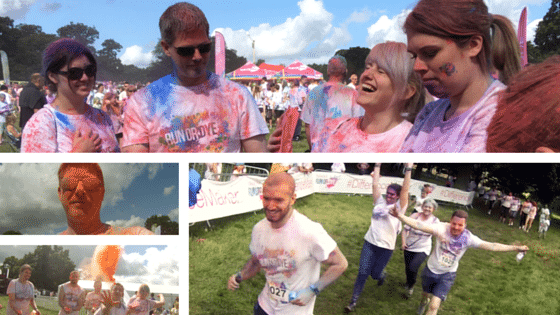 We ran, walked, danced, jogged, and fell (sorry Lee…) the 5k Run or Dye on Sunday 3rd July at Tonbridge. It started with most of us waking at 5.30am, to catch a convoy at 7am, to be at the event by 8.30am. Once we arrived, we realised just how big the event was going to be. Hundreds of people had already arrived to an event that was promising thousands. DJs were in full swing, food vendors were touting their business (I wouldn’t say no to a crepe at that time in the morning! ), and people were pelting each other with paint. 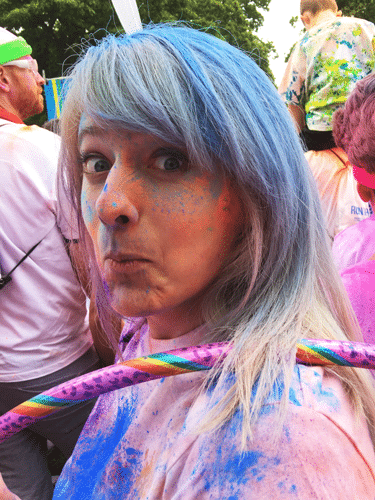 We spent two hours eating, drinking, gawking at Victoria Pendleton, and taking a number of colourful selfies – all before the race promised to begin at 10.30am. That time rolled around and our eager beavers, Heather, Ben, Lee and Shaun made their way to the jogging wave, while us lazy butts joined half-way through. 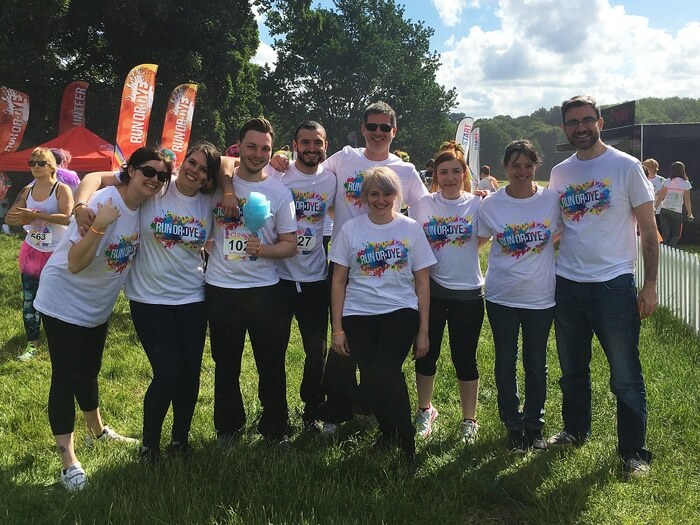 Music was blaring out at all angles, promoters were psyching us up, the runners were screaming out in excitement – to be honest, I was actually raring to go by the time we were released! 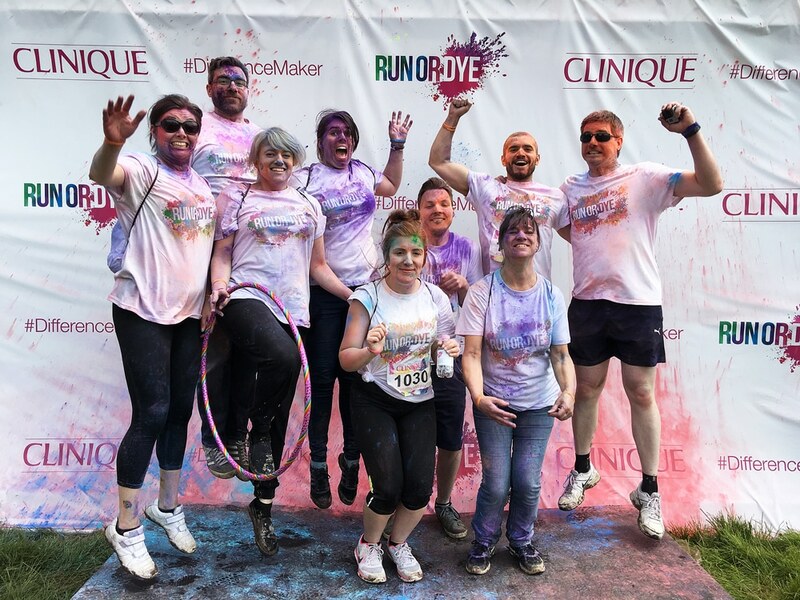 Every 1km we were blasted by paint cannons and people with cups full of different coloured powders as we took in the amazing countryside, avoided the increasingly muddy traps, and snuck up ninja-like on our friends to paint them orange, purple, green, blue and pink! An hour’s walk seemed to pass in minutes, and we were finished before we really knew we’d begun! Now, if you’ve read our last blog about this, you’ll know how much I was looking forward to this, but actually – it was a great day! Thousands of people pelting each other with paint wasn’t my idea of fun, but you get there and you can’t help but get involved! The organisers kept the powders flowing – for a price, of course – the activities were plentiful, the space was gorgeous, and I saw no-one with a grumpy pout on their faces. The event was due to finish at 1.30pm, but I honestly think we could have stayed for a lot longer. Is there an event you want to do? Challenge SGM is dedicated to helping those in need and also those wanting to help as well. If you’ve ever wanted to do an event for charity, but found hiccups along the way, we’re here to help!